It’s getting dark earlier, the leaves are well and truly falling and there is a chill in the air – yup, it’s definitely autumn! Whilst autumn in the UK is beautiful, especially when the light is just right and its not raining, in Asia it can be even more impressive. In fact, it can be the ideal time to travel to some destinations, not just for the vivid colours, but because the weather is better, it’s less crowded or the visibility is perfect. So, treat yourself to a more exotic autumn with one of our top autumn destinations. In Japan, the seasons seem so much more pronounced than anywhere else, and autumn is no exception! Although not as popular as cherry blossoms in the spring, Japan’s autumn colours are jaw-droppingly spectacular, and just as well celebrated. The best colours are found farther north, so the island of Hokkaido is particularly blessed with spectacular spreads of reds, golds, yellows and browns. 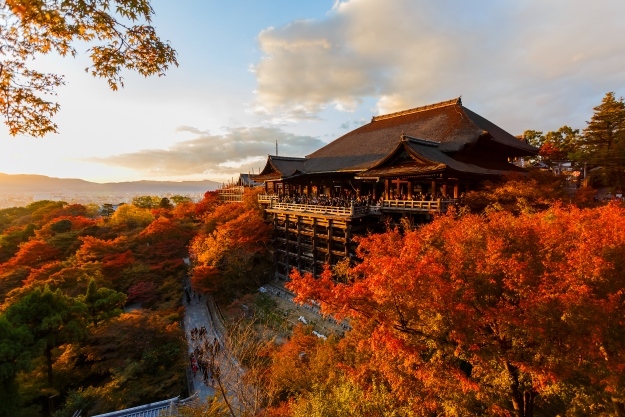 Another great place to enjoy the foliage is the historic Kyoto, a city full of temples, shrines and gardens packed with maple and gingko trees – Tofuku-ji is a must visit! 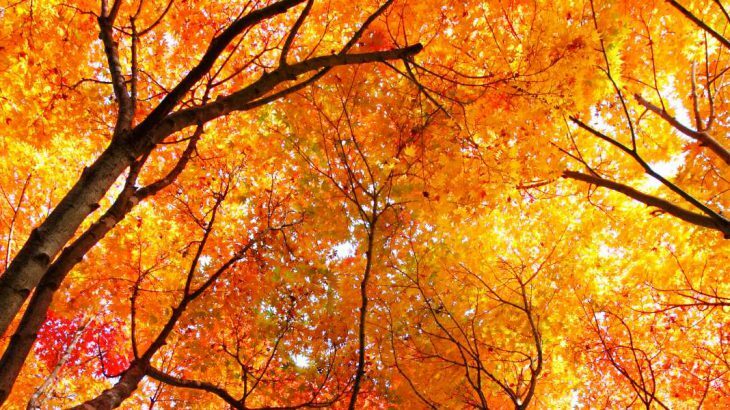 Japan’s autumn colours can last about 2 months, from mid-October to mid-December. Autumn is considered the best time for China holidays as the weather tends to be warm and dry, and much more comfortable than other times of the year. Across the country, hues of reds and yellows appear throughout the countryside. The Great Wall, lined by vivid trees and forests, is an even more spectacular sight than usual whilst farther south, the terraces of Longji (near Guilin) and Yuanyang (Yunnan province) turn a golden yellow as the rice ripens for harvest. 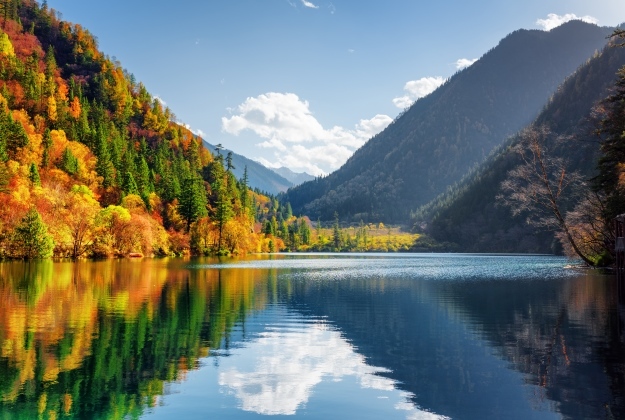 But it is Jiuzhaigou National Park that offers the most glorious autumn vistas. The vast forests become a blanket of colour which is then reflected in the park’s many lakes – an explosion of autumn! China’s autumn is typical from mid-October to early November. Mid-September to November in South Korea brings clear, dry weather and beautiful blue skies. It also ushers in the bountiful harvest and the crimsons and golds of autumn. 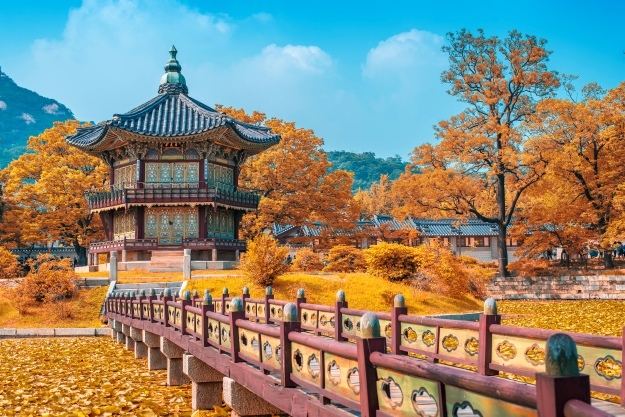 South Koreans celebrate the season by spending as much time as possible outside, be it amongst the maple and gingko trees of Seoul’s parks, or hiking amongst its abundant nature. Head up the N Seoul Tower to admire the colours from above, or wander through one of the palace complexes to enjoy them up close. About three hours out of the city is Seoraksan National Park, considered one of the most beautiful places in South Korea to experience autumn. A spectacular scenic area anyway, the fall colours make it even more breathtaking. South Korea’s autumn is roughly mid-September to November. Autumn in Bhutan brings warm days, cool nights and clear skies, giving unparalleled views of the country’s many snow-capped peaks. The autumnal colours are understated here, simply the gold of the ripe rice paddies and the colour-changing mood of the mountains, but this harvest time brings an atmosphere of joy and celebration. 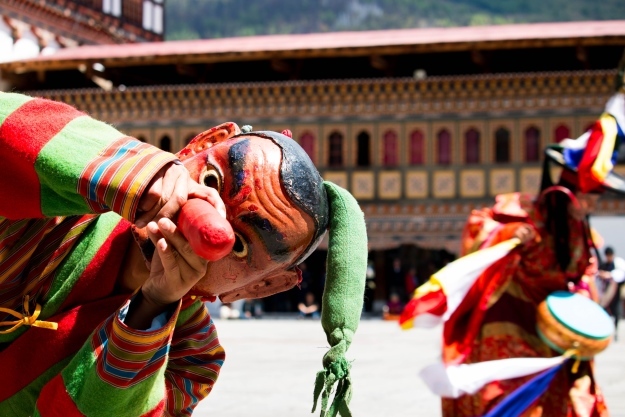 Bhutan places great emphasis on traditional culture and values and at this point of the year there are plenty of colourful festivals, such as Thimphu Tshechu and Thangbi Mani, that will give you a chance to experience it first-hand! Autumn in Bhutan starts in late September and ends in November. It’s not about the colours in Nepal in autumn, it’s about the incredible views of the Himalayan mountains. As the rains of the summer monsoon clear the dust and pollution from the air and there are the peaks, in all their glory! Along with relief from the scorching sun and heavy rains, autumn also brings days that are mild and dry, skies that are endless blue and there are some big, fun festivals to enjoy – like the Hindu celebrations of Dashain and Tihar. It’s a very popular time to go hiking and to generally enjoy the majestic nature of this mountain kingdom. Nepal’s autumn comes when the monsoon rains end in about mid-October and lasts into mid-December. Rather have some autumn sun? Whilst there aren’t many destinations for sunseekers in Asia in October, both Bali and Goa have reasonable weather and sunshine at this time of year. Wait one month for November though and the monsoon lets up across Southeast Asia, meaning destinations such as Thailand, Vietnam, Burma and Malaysia are ready for visitors! November is the wind up to the busy season, so get in there early to miss some of the crowds. Wendy Wu Tours may operate a fantastic range of escorted tours to China, Japan, India and Southeast Asia, but we also create bespoke, tailormade itineraries across Asia, for whatever season you’d care to travel in – give us a call now to start creating your perfect holiday! General adventure, autumn, festivals, nature, top things to see. permalink.